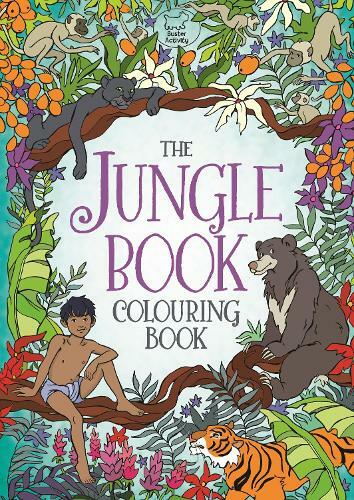 'A beautiful colouring book with illustrated scenes from Rudyard Kipling's classic The Jungle Book'- Toppsta Get lost in the depths of the Indian jungle with beautifully illustrated colouring scenes from Rudyard Kipling's classic The Jungle Book, in this brand new colouring story book. Colour your way through the jungle vines and meet Mowgli the man-cub, his enemy Shere Khan the tiger, and get carried away by the mischievous monkeys and hypnotized by Kaa the python. Published in 2016, to coincide with the release of Disney's new live-action version of The Jungle Book, children can take their adventures beyond the screen with everyone's favourite man-cub. Relive Mowgli's adventures in the jungle over 32 partially coloured pages.